To get a spacious feel in a small house, choose an open floor plan design with a great room over walled compartmentalized rooms. This works particularly well in a small house. 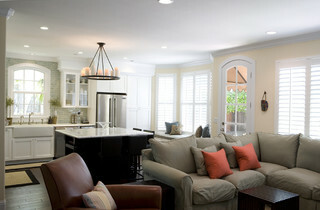 Great rooms usually encompass the functions of a family room, living room, dining room, and kitchen in one shared space. In a small house, this might also include an office, study, or library. In a studio house, it would also include the bedroom. Putting these spaces together in an open floor plan creates a comfortable amount of square footage. Putting them into separate walled rooms in a small house would make them each feel cramped. 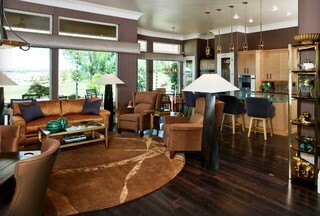 Some creative interior design could make a great room in a small house look very elegant and advanced. 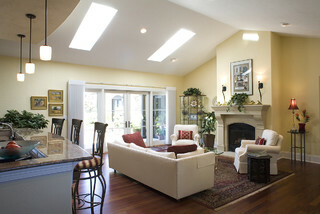 For example, you could create separation for say an office or bed area with a split-level design or a loft. Or you could merge kitchen and dining activities into one location by putting a food preparation and eating area in a single unit like an island or counter. When it comes to small houses, great rooms are the way to go. 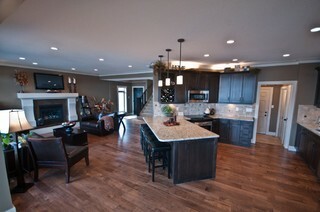 The more open the floor plan the more spacious the feel.